THERE is an outside chance star youngster Ultimate Sniper may miss the Harness Jewels. Despite Ultimate Sniper’s victory in last night’s New Zealand Derby at Addington, co-trainers Mark Purdon and Natalie Rasmussen harbour concerns about the colt. Ultimate Sniper first caused alarm bells at his previous apperance when he galloped soon after the start before finishing towards the tail of the field. It’s the only time the son of Bettors Delight has missed the placings from 10 outings, with his record sitting on eight wins and a second. “Him galloping last time is something we haven’t been able to a put finger on,” Purdon said. “Even last night Nat wasn’t entirely happy with him. “Maybe something is worrying him but we can’t pinpoint it at this stage. Caught in the ‘death seat’ early from barrier six, Ultimate Sniper worked to the lead during the middle stages before scoring by a metre-and-a-half from Supreme Dominator. Jesse Duke, a stablemate of the winner, was two metres away third in 1:59.6 over 2600 metres. Ultimate Sniper provided Purdon and Rasmussen with their second Group One win of the night after the power couple captured the Easter Cup with boom pacer Turn It Up. Having just his 11th start, the four-year-old upstaged a strong field, including his stablemates Spankem and Thefixer, which filled the quinella in last month’s Miracle Mile at Tabcorp Park Menangle. Overcoming a 10-metre handicap, Turn It Up rated 1:59.8 over 3200 metres to account for A G’s White Socks and Thefixer. 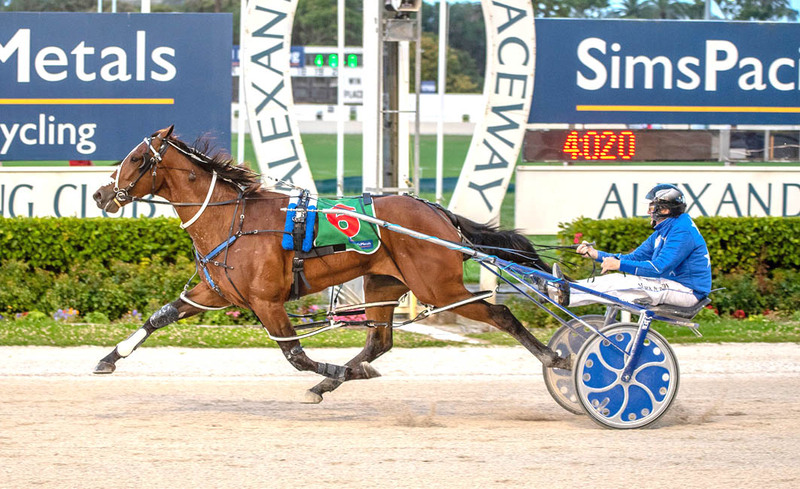 An Australian Pacing Gold purchase, the lightly-raced gelding stretched his tally to nine wins and two seconds for earnings of $321,500. Purdon stated the son of Courage Under Fire will be kept “ticking along at home” ahead of the Taylor Mile on April 26 and the Messenger Stake the following week.